South Korean President Park Geun-hye is facing increasing pressure to resign as hundreds of thousands of demonstrators join nationwide protests over corruption claims. 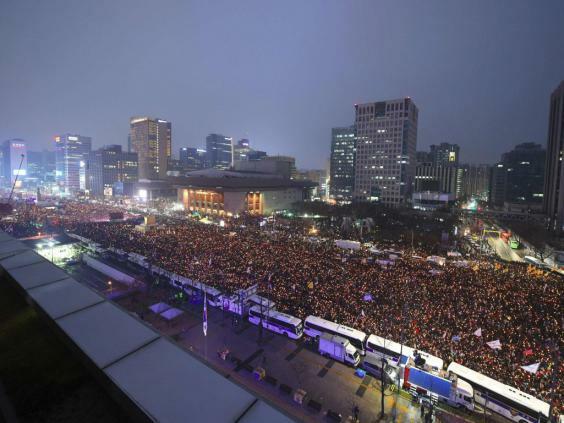 In what is believed to be one of the largest demonstrations so far over the allegations engulfing Ms Park, organisers said 1.3 million protesters filled the streets in the capital of Seoul on Saturday evening, with 1.5 million estimated to join by the end of the night. Some 500,000 people are expected to turn out in other regions. Police put the number of participants in Seoul at 260,000. 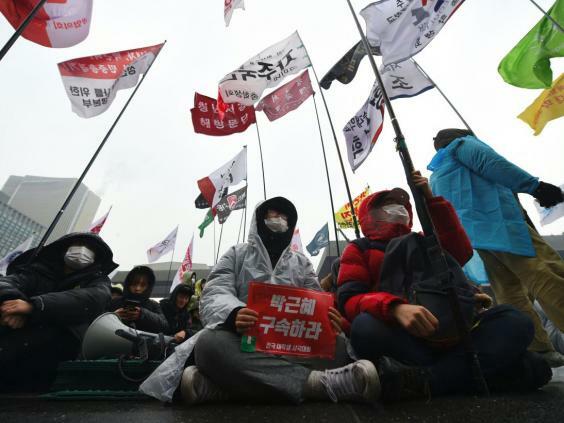 The demonstrations mark the fifth straight weekend of protests in the country, and are among the largest seen in South Korea since the pro-democracy protests of the 1980s. Farmers, university students and Buddhist monks were among the demonstrators, who beat drums and chanted “Park get out now”, as they marched towards the Presidential Blue House, which had been cordoned over by 24,000 police. The president is bracing for an impeachment push by opposition parties and some members of her own Saenuri Party. There are allegations she let her long-time confidante Choi Soon-Sil, who has been arrested for fraud and abuse of power, influence government affairs and amass an illicit fortune despite holding no official position – a scandal critics say undermines the country’s democracy. Sixty-year-old Ms Choi allegedly used her relationship with Ms Park to drive donations from conglomerates, including SK, Lotte and Samsung, to non-profit foundations, which she set up and used for personal gain. Ms Park has issued two public apologies over the scandal, which have only served to fuel public anger and suspicion, but has resisted repeated calls to resign. She has promised to submit herself to an expanding probe by prosecutors, as well as a separate investigation by an independent special prosecutor to be appointed by parliament. This gives us an idea what it takes to unseat a president! Please note well.